I started off just after 7:30pm Friday night from a Service Station in Cirencester (one of the 3 "Touring" starts) for a 70 mile road ride to the Haynes Museum in Yeovil, passing a 3 car accident in Chippenham. 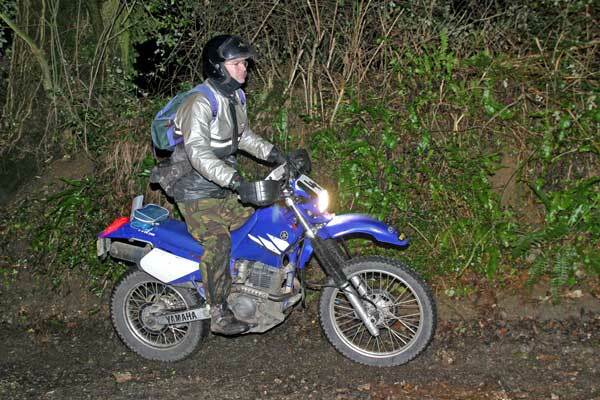 It rained nearly all the way and I was glad I had fitted heated grips and remembered my Sealskinz socks! After a full English breakfast and a tour of the museum we were off just after midnight for the 16 sections (including 2 timed tests), 10 of which were tackled in the dark. I think there were 90 bikes and 260 cars entered this year - with a vast selection of bikes from very early rigids to modern KTMs and even a team of Army riders on 350 Harleys, though I didn't see any Pamps (unusual for a LDT). One of the car entries was a VW Beetle from the Channel 5 programme, Fifth Gear, with the Trial footage aired on 4th Feb. The sections were mainly green lanes and with a straightforward "up the lane" route - though some of the hills had restarts to make things more interesting. There was very little "off-road" going between the sections, most of it was A and B roads. Luckily the 2 riders in front of me (one on a 1950 350cc Matchless) had done the event many times before and were more than happy to lead the way - so I didn't really need to refer to the excellent road book. The promised clear skies after midnight turned out to be stormy, heavy showers. We stopped for another breakfast just after 5am at the M5 services near Exeter and then rode through a hail storm to the next section. 4 more sections were then tackled before a cup of tea and pasty break in a village hall just before the infamous Simms hill - which didn't turn out to be too difficult. Then it was a couple more sections and onto the finish at Torquay just after noon- 160 miles after the Haynes museum. The whole event was very well organised with a large team of very committed volunteers - sections had up to 10 observers (because of the dark) who would have to be out in the elements for 6 hours or so. I am still waiting for the final results, but the provisional results show me with a Gold medal.